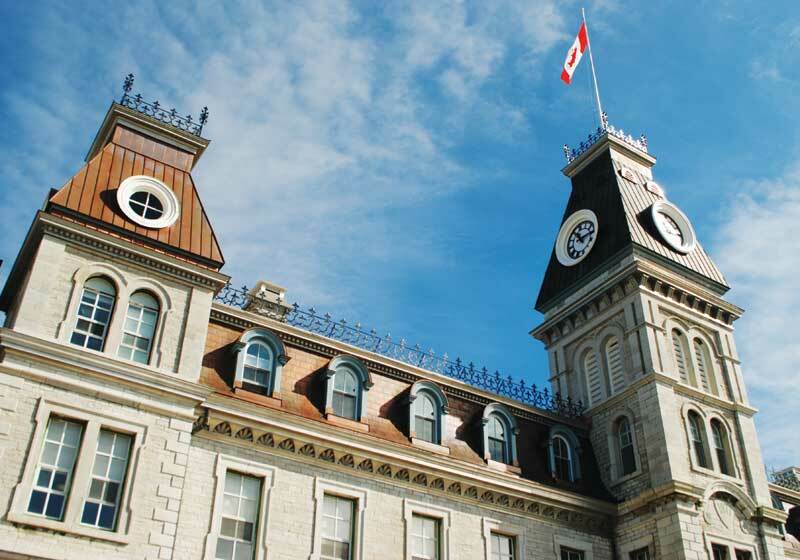 East of downtown Kingston, Ont., overlooking the St. Lawrence River and Lake Ontario, the Royal Military College (RMC) is notable for its blend of modern academic, athletic, and dormitory facilities, with century-old buildings. The school underwent restoration to preserve its historic landscapes, including the recent copper roof replacement of the Currie and Mackenzie Buildings—two of the college’s oldest and most recognizable. The site of the college has been an active military base since 1789. The 40-ha (101-acre) peninsula also played an important role in the War of 1812. During this time, the land became the centre of British naval operations, as control of Lake Ontario would give them crucial wartime advantages in initiative, surprise, troop movement, and re-supply. Following the war, the college was established by an Act of Parliament in 1874 to provide a complete education in all branches of military tactics, fortification, engineering, and general scientific knowledge in subjects connected with and necessary for thorough knowledge of the military profession. The college was modelled after the United States Military Academy at West Point. In 2013, the restoration team conducted a detailed investigation of the RMC roofs and their structural detailing using a lift to get an up-close view of the structures. They found both buildings were in need of new copper roofing systems due to age, weathering, and poor original installation methods. Erected in 1876 for the training of military and civil engineers, the Mackenzie Building—formally known as Building No. 16 and the Education Block—was RMC’s first dedicated education facility. The structure is a Classified Federal Heritage Building and is considered one of the top 10 most significant heritage buildings in Canada. It is one of the best examples of the work of Thomas Seaton Scott, who was the chief architect of public works for the government. The structure originally had a slate roof, but a pan-shaped interlocking copper roofing system was installed in the 1960s. Though the college has changed, the building has remained an integral component of the RMC, retaining its original relationship with the open expanse of the parade ground. Cornice and gutter detailing following the restoration project. However, the Mackenzie Building’s prominence was nearly compromised in the early 1900s by design plans for the Currie Building. The large, impressive Gothic building was designed to be the centrepiece of the RMC’s parade square and of the entire campus. In fact, the style of the building was envisioned for all new buildings onsite. Had it been completed as predicted in RMC’s 1910 expansion plan, the building would have replaced the Mackenzie structure as the college’s main administrative and educational facility. However, the structure was never entirely completed as designed due to federal government measures following the First World War and during the 1920s. The roof of the Currie Building was originally constructed in clay tile, but was later replaced by a copper batten-seam roofing system. However, as the restoration team discovered, its improper installation caused several points of leakage throughout the roof. 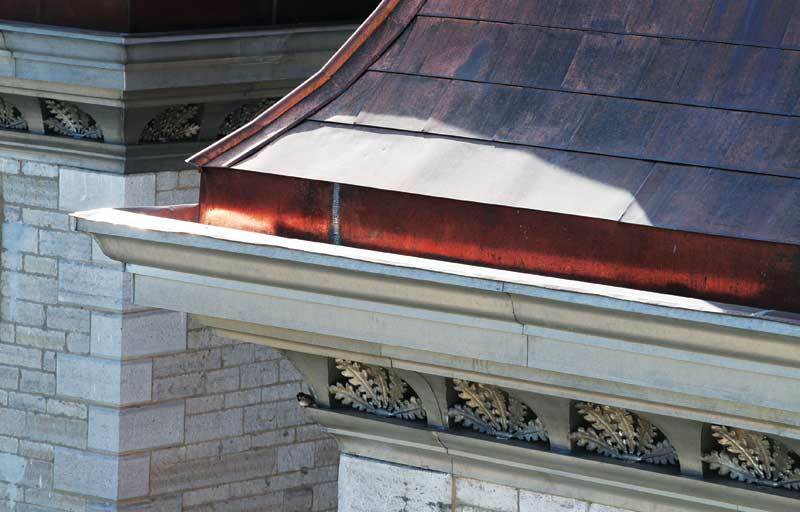 Batten-seam roofing consists of copper pans running parallel to the roof slope, separated by wood battens. Properly installed battens are covered with copper caps, which are loose locked into adjacent pans. The width of these preformed or field-formed pans may vary. The original installation of the copper batten-seam roof on the Currie Building did not include proper caps. One of the most important issues in the use of copper is the ability of the various interlocked components to address expansion and contraction. Movement can occur as a result of temperature changes, or from external sources such as wind, ice, or stresses in the substrate or substructure. Since copper is most often used as an external water-shedding barrier, installations must account for this anticipated thermal movement, as well as prevent the infiltration of water.